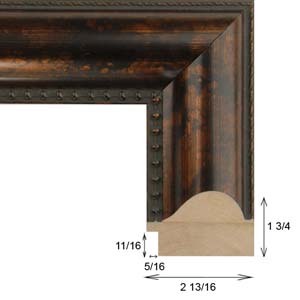 The profile width of this copper brown wood picture frame is 3”, and the rabbet depth is 11/16”, making this substantial frame ideally suited to matted artworks on paper, as well as beveled mirrors and original fine art paintings on ¾” stretched canvas. Works on paper may include original fine art prints, etchings, lithography, watercolor paintings, ink drawings, pencil drawings, and fine art posters. 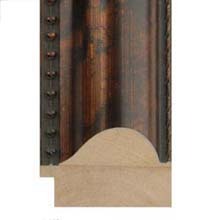 Interior design styles and settings that pair with this wood picture frame include Art Nouveau, Explorer, and Arabian styles, along with Old World, Mexican, and Medieval settings. Clearly, the mottled copper finish offers a versatile aesthetic. For matted works on paper, consider colors from our acid free archival selection such as Wet Sand 9515, Tusk 9516, Coffee Bean 9842, Fresh Brew 9590, Harvest Brown 9835, Olive Branch 9532, Sienna 9818, and Bruxelles 9853.